Don't let the name fool you! The Tunisian knit stitch isn't actually knitted, Rather, it's actually a crochet stitch. 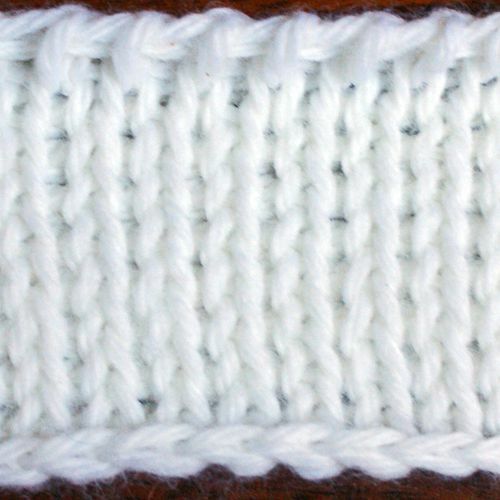 It's only called a knit stitch because it looks like stockinette stitch (AKA stocking stitch) in knitting. This tutorial will teach you how to work the Tunisian knit stitch, which is a handy stitch to know if you'd like your crochet work to resemble knitting. If you aren't already experienced with Tunisian crochet, you may also wish to learn how to hold a Tunisian crochet hook. Once you've learned this stitch, be sure to check out a couple of fun projects you can use for practicing it. Hint: The Tunisian knit stitch is a fantastic stitch for using all those beautiful, eye-catching variegated yarns that are available. I've seen different terminology applied to this beginning row. It is sometimes called the "base row," and is sometimes referred to as the "foundation row." There may be other names for it as well. Rows like this where you are drawing up loops can also be called the "forward" or the "forward pass." If you haven't already figured out a comfortable way of holding your hooks when you do Tunisian crochet, you may wish to do this first. To get started, crochet a starting chain of any length greater than two stitches. To begin the Tunisian knit stitch, you could work into either the front side or the back side of your starting chain. I usually prefer to work into the back of the starting chain. That way, there will be two loops free to work into across the lower edge in case I want to add an edging or embellishments to my work later. If you take a look at the lower edge of the work in view H, you'll see what is meant by "two loops free". Views A, B, and C demonstrate how it looks if you work into the front of the starting chain. Views D, E, F, G, and H demonstrate how it looks if you work into the back of the starting chain. To begin, insert your hook into the second chain from your hook. View B shows my crochet hook pointing to the spot where I'd insert my hook if I were going to work into the front of the chain stitch. View E shows my crochet hook pointing to the spot I'd insert my hook when working into the back of the chain stitch. View F shows my crochet hook inserted into the chain stitch. Next, pull up a loop (views C and G). You're going to leave this loop on your crochet hook for now. Insert your hook into the next chain stitch and pull up another loop. Repeat that step, inserting your hook into the next chain and pulling up another loop. Keep pulling up loops until you have one loop on your hook corresponding to each chain stitch in your starting chain. When you're finished with this, your work will somewhat resemble view H in the photo collage. Don't turn your work; keep the front of the work facing you. The next part has several different possible names. Some people call it the "return" or the "return pass." Some people call it the "reverse" as well. When following other designers' patterns constructed using this stitch, you'll find that some people call this "row 2" of the work, while others envision it as being the second half of row 1. To complete the return or reverse pass for the Tunisian knit stitch, work a chain stitch by looping the yarn over your hook and pulling it through the last loop on your hook (views I, J, and K). *Yarn over (view L) and pull it through through two loops (views M and N). Repeat from * all the way across the row until only one loop remains on your hook (views O and P). The remaining loop on the hook will count as the first stitch in the next row. Again, the terminology for this aspect of the technique is not standardized. Some people call this "working off the loops" or you might read instructions telling you to "work off the loops by twos". Others refer to this as "binding off" or "casting off" which is perhaps how a knitter might express it; there are definite similarities here to the process of binding off in knitting. If you were going to work Tunisian simple stitch, the next step would be to work stitches into the vertical bars all the way across the next row. You're not going to do that here, but the vertical bars create an important frame of reference. There's a vertical bar below your active loop, but you can't really do anything with that one, so just ignore it and use the next closest vertical bar as your reference point. Using your crochet hook, you're going to pierce the fabric completely through from front to back, as shown in view R, and the spot to do it is directly to the right of the vertical bar (view Q). After you've pushed your hook through the fabric, yarn over and pull up a loop. If your hook went in at the correct spot, the result will look something like view S.
Continue pulling up loops in this manner all the way across the row. Next you'll repeat the steps for completing the return pass/reverse; it's exactly the same here as it was the first time you did it. To add more rows of the Tunisian knit stitch, just keep repeating the steps you already learned. After you work the reverse, the work will look something like view aa. Then proceed with drawing up another row of loops and working them off by twos. Now you're ready to do the Tunisian knit stitch like a pro!